The name Tegalallang is probably still less familiar sounds in the ears of the tourists in Bali. During this time the name of Bali's tourist attractions have been widely known perhaps only Ubud, Kuta, Badung, and other popular place – place. Whereas Tegalallang is one of the destinations that should not be missed while on vacation to Bali. Why you should pay a visit to the place? The reason this place from the first known through the beautiful scenery of rice teraseringnya. Yes, Tegalallang is a spectacular and beautiful rice field with an area of more than 61 square km with terrace – terrace of the contoured hills and farms able to withstand erosion. The uniqueness of Tegalallang or disebuat of farmers in Bali. 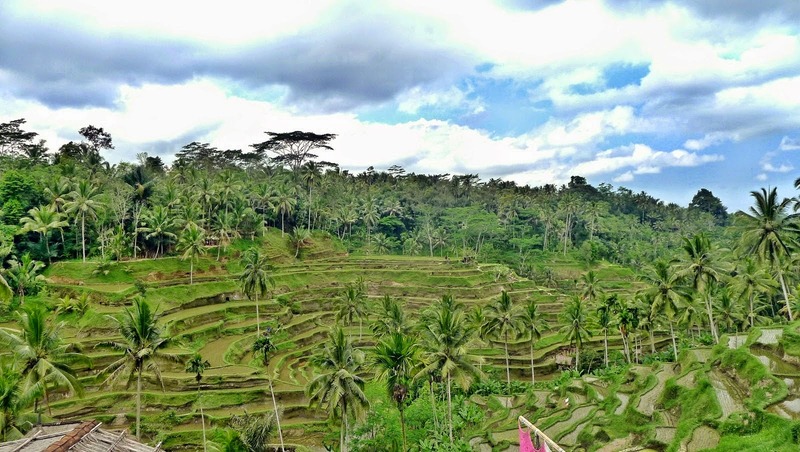 In addition to presenting a panorama of rice terracing and a beautiful natural landscape, the friendly greetings and a warm welcome from the locals will also make you more eager to come again to Bali. If you want to shop while visiting Tegalallang, just above the rice terraces at the edge of the road You can find some craft stores that offer a wide variety of gift – Bali. On the way home or away from the rice fields Tegalallang, you will pass hundreds of stores – shops selling Balinese handicrafts. A wide range of hand-crafted in the shape of the cat kind, giraffes, and dolphins are made of iron or wood. There is also a wide range of painting and bags of various types of materials, wood carving, stone carving, assorted minor padas handicrafts made from glass, and wooden masks that can be used by tour Bali – by from. Showroom and store is lined along a 10 km area is growing into a typical Balinese art handicraft. Maybe just sub that has a row of shops the world's longest art craft. 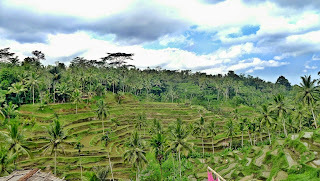 At Tegalallang, you can enjoy the atmosphere of a typical rural scenic rice terraces. The majority of tourists come or go to Kintamani will stop in the area to see the beauty of verdant rice fields view while enjoying lunch or enjoy typical dishes of Bali while accompanied by a delicious coconut drinks. There is a gazebo which was built on top of the rice fields. Gazebo which is the property of cafe offers a comfortable cross-legged and equipped with tables. A cup of tea or coffee will accompany you to enjoy the beautiful atmosphere of the afternoon or morning hours in this place. In addition to offering views of rice fields, terracing you can walk – the road down the Hill rice fields there and see a lot of Palm trees that can be a great backdrop for a photo session. In this Bali tourist attractions as well as many little girls selling photos and features on foreign tourists. Interestingly, these kids are able to do the bargaining is in a foreign language. Occasionally they use the language of the United Kingdom, China, Japan, or France. Children were also very friendly and will not force the prospective consumers.